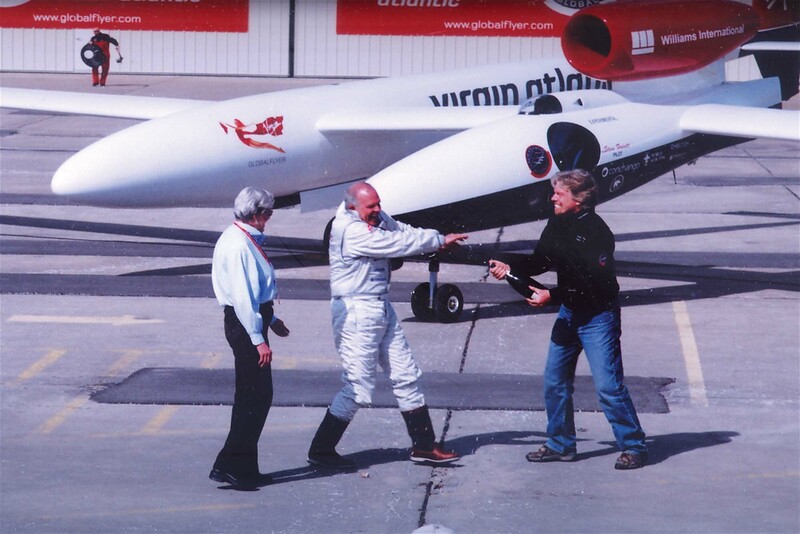 Sir Richard Branson, president and CEO of Virgin Atlantic Airways, sprays GlobalFlyer pilot Steve Fossett with champagne after his successful flight. The Wings Club, the premier aviation club in the U.S., has announced that Sir Richard Branson, chairman of The Virgin Group of Companies, is the recipient of The Club’s 2005 Distinguished Achievement Award. The award, which honors “outstanding accomplishments in the field of aviation and astronautics,” will be presented on Oct. 28, 2005, at The Wings Club’s 63rd Annual Dinner-Dance at the Waldorf-Astoria Hotel in New York City. A savvy entrepreneur, Sir Richard Branson’s first foray into business took place in 1968 when the first issue of Student Magazine went to print. Inspired by the magazine’s success in 1970, Branson founded Virgin as a mail order record retailer. Shortly thereafter he opened a record shop on Oxford Street, London. During 1972, a recording studio was built and the first Virgin artist, Mike Oldfield, recorded “Tubular Bells.” The record was released in 1973, launching Virgin as a record label (Virgin Music was sold in 1992 to Thorn EMI). That same year, Branson started up a music publishing company; in 1984, the award-winning Virgin Atlantic Airways and Virgin Cargo took off. Today Virgin Atlantic is the second largest British long haul international airline, operating flights from London to more than 20 destinations around the world. Over the years, the Virgin Group continued to expand and today includes international music megastores, air travel, mobile, financial, retail, music, Internet, drinks, rail, hotels and leisure, with approximately 200 companies in over 30 countries. Always seeking adventure, Branson has been involved in a number of world record-breaking attempts since 1985. In 1986 his boat, “Virgin Atlantic Challenger II,” crossed the Atlantic Ocean in the fastest ever recorded time. This was followed a year later by the epic hot air balloon crossing of the same ocean in “Virgin Atlantic Flyer.” This was not only the first hot-air balloon to cross the Atlantic, but was the largest ever flown. In January 1991, Branson crossed the Pacific Ocean from Japan to Arctic Canada, breaking all existing records. Additionally, between 1995 and 1998, along with Per Lindstrand and Steve Fossett, he made a number of attempts to circumnavigate the globe by balloon. In late 1998, they made a record-breaking flight from Morocco to Hawaii. 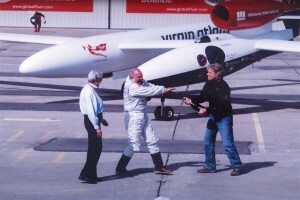 The Virgin Atlantic GlobalFlyer, piloted by legendary aviator and record breaker Steve Fossett, left Salina Airport, Kansas, on Feb. 2, 2005, and returned on March 3, after its historic solo round-the-world flight, completed in 67 hours, 2 minutes, 38 seconds. Branson accompanied the plane on the last leg of the flight back to Salina on board a chase plane. The Wings Club’s Distinguished Achievement Award has been presented annually since 1975. Past recipients include astronaut Neil Armstrong, Senator John Glenn, former President George H.W. Bush, as well as 11 former airline CEOs including Fred Smith, Bob Crandall, Herb Kelleher, Gordon Bethune and Sir Colin Marshall. The Wings Club was founded in 1942 and is a private membership club. It’s comprised of industry leaders, management, pilots and professionals in related service organizations, dedicated to preserving the history and perpetuating the traditions of aviation, while providing a forum for discussion and debate on aeronautical and aviation issues. As the premiere international aviation club, The Wings Club recognizes and honors significant achievements contributing to the advancement of aeronautical and aviation matters. For more information on The Wings Club or to become a member call 212-867-1770, email wingsclub@aol.com or visit [http://www.wingsclub.org].